SEASOFT Ankle Weights 1.5 lb. each (Pair) are the best selling size of ankle weights. They are popular with drysuit divers to offset the positive buoyancy of the air inside the legs of drysuits. With the advent of weight integrated BCs and steel tanks, the upper body of most divers will tend to dive lower than the legs. This can produce hydrodrag when the tank and legs are not following the upper body. When you wear ankle weights you transfer some of the weight which helps brings the legs into alignment and assists in eliminating unneccessary hydrodrag. Women, in particular, because they are often shortwaisted, will have their weights located higher on their upper body. Because of this, their diving alignment is thrown more out of balance and ankle weights are even more important as a tool to correct this imbalance. Water is 800 times more dense than air so hydrodrag can seriously cost you in speed, air consumption, fatigue and bottom time. Why should I buy these SEASOFT 1.5 lb. Ankle Weights? SEASOFT's 1.5 lb. (each) Ankle Weights are their most popular selling size of ankle weight. Popular with both shell (bag) and neoprene drysuit divers, SEASOFT 1.5 lb. Ankle Weights are used to offset the extra buoyancy of the air found in the legs of most of the popular drysuits used today. They are also useful for these applications. 1) Your diving position is important to good diving skills, being horizontal with a slightly legs up attitude is correct. Some divers dive with their legs too high causing excessive drag. SEASOFT 1.5 lb. Ankle Weights can be used to correct this. 2) If you have more weight toward the head then the legs will tend to go up. Think of your body as a teeter-totter, if most of the weight is at one end, the other end will go up. Most BCs have the weight and trim pockets closer to the head, causing the legs to float too high, this leads to excessive hydro-drag. Then there are steel tanks, lights etc. SEASOFT 1.5 lb. Ankle Weights can be used to correct this inbalance. All SEASOFT Ankle Weights use a top quality 3 mm medium density neoprene designed for long lasting wear and abrasion resistance. We use size 7.5 lead shot that has been tumbled in black graphite to coat the lead with several layers against corrosion to protect you and the environment. We use a high strength curved side-release buckle that is guaranteed for life against breakage. All our ankle weights are warranted for 4 years against any lead coming out on any seam. SEASOFT SCUBA is the only leading manufacturer of scuba weights to coat its lead shot in layers of graphite. This seals the lead shot from the water and you for a lengthy period of time. Though it will eventually wear off, it normally takes years to do so. You might notice a slight black runoff from your ankle weights for the first couple of dives, this is normal as the product rids itself of excess graphite. But we feel that protecting you and the environment from toxic lead is more important. Please hang your SEASOFT Ankle Weights to dry after every use. If you do not, the water will corrode through the graphite over time and the lead will start to corrode. If you hang your ankle weights to dry, the graphite will remain intact for a very long time, and protect you and the environment. 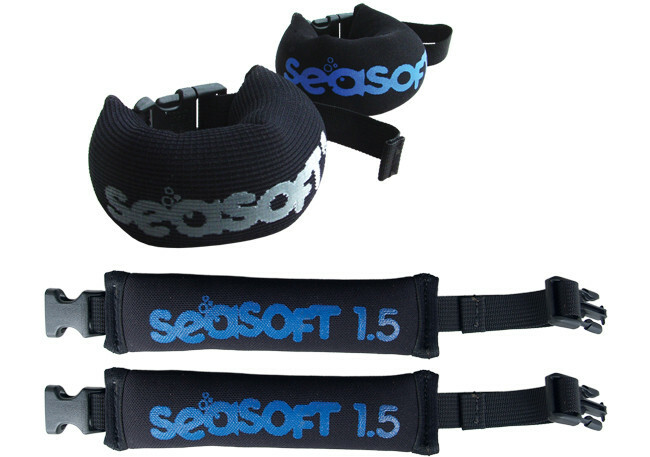 SEASOFT Ankle Weights™ are available in 1 lb., 1.5 lb., 2 lb., 3 lb., & a 5 lb. pair for commercial use. SEASOFT Ankle Weights™ are the best selling ankle weights in the world with many sizes and colors. Ankle weights are an important part of a diver’s total weight system.